Thappalam(Dappalam) is an Andra style puli kulambu made similar to sambar but with slight variations.I had bookmarked this recipe soon after Veena had posted this in her space.It was worth trying for a alternate curry with rice other than sambar though I tweaked lightly,Thanks Veena.All liked it at home and this is healthy curry with all vegetables.The only major difference I found in this recipe from sambar is the absence of toor dal(tuvara parippu) and rice flour mixed with water is added to get the required consistency.Thappalam is balanced with spice,sour and sweet flavors.Do try it out if you find this interesting and lemme know the feedback too. Mix the rice flour in 1/4 cup water and keep aside.Soak the tamarind in water for 20 mins and squeeze the pulp,keep aside(if you are using tamarind paste,leave out this step). Heat a pan with oil in it.Splutter mustard seeds when hot followed by cumin seeds and dry red chillies..Add in the asafoetida,green chillies,onion and curry leaves.Saute slightly until onions turn translucent and then add in the vegetables with salt.Add a cup of water,close the lid and let it cook for 10 mins on medium flame. Add in the tamarind water,red chilly powder,turmeric powder,coriander powder.Mix well and cook for another 2-3 mins covered. Add the rice flour mixture and jaggery.Mix well and cook covered for another 5-6 mins until the kulambu becomes thick in consistency.Switch off flame and serve warm with steamed rice. * I used carrot,cluster beans,muringakka(drum stick),pumpkin,bottle gourd(lauki). * Adding water and rice flour is as per your requirement of the consistency of the kulambu. 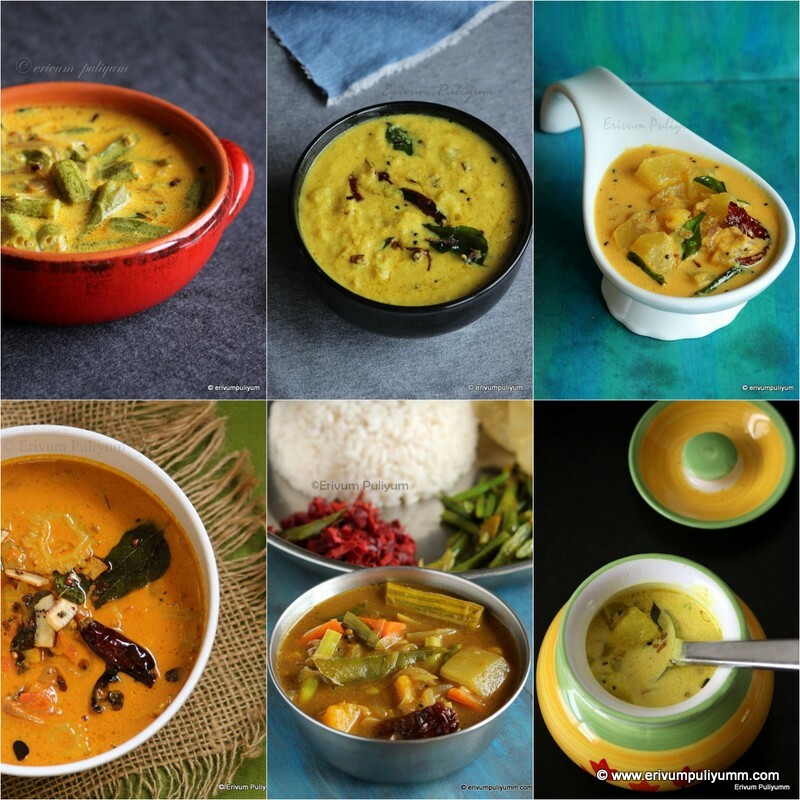 * I saw another video recipe where they use onions too and so added.Also,in that recipe they use cooked toor dal instead of rice flour for adding consistency.I skipped the dal part and added rice flour.You can use as per your choice. Once the school started,I always crack my head to make a healthy filling lunch box or snacks for kids.Moreover,every kid demands and loves variety in their lunchbox and snacks.Do you feel the same for your kids?? Its hard to feed dates just like that to my kids but this fudge was an easy quick idea.Dates-Nuts fudge /Khajur burfi is a healthy school snack for kids and is filling too.My younger kid is very fond of this sweet fudge.There is no use of sugar in any form other than the sweetness from the dates.Almonds,cashews,walnuts add to the crunch and health too.This recipe hardly has any cooking and can be made ahead and stored.It stays good for days and as winter is approaching dates and nuts are very good in this weather.I already have a Dates Nuts laddu in the blog that I posted few years back which tastes similar to this burfi.If you feel your kiddo is like mine,then definitely this is a must try snack on one of their school days and enjoy !! Roughly chop the nuts in smaller pieces and place on a plate.Also,chop the dates roughly in smaller pieces.Keep aside. Heat the pan and dry roast all the chopped nuts for 4-5 minutes on medium flame without burning.Transfer on the plate and leave aside. In the same pan,add ghee.When its hot,add the poppy seeds(khus khus).Roast for 2 minutes on low flame.Add in nutmeg and cardamom powder. 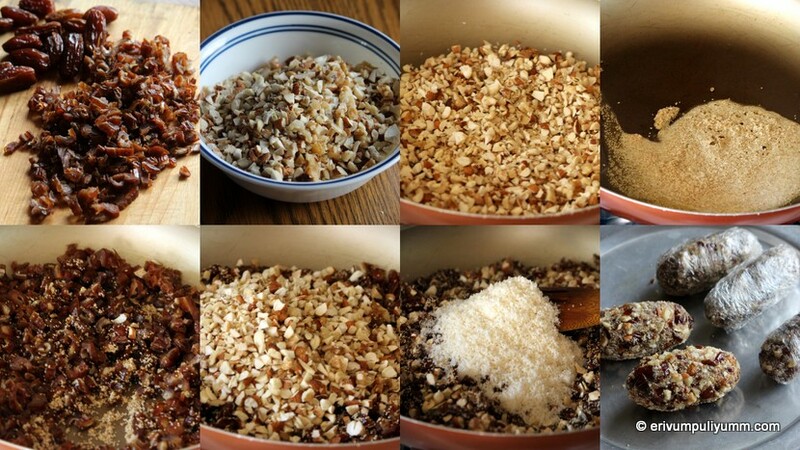 Then add in the chopped dates.Then add in chopped nuts and dry coconut powder.Keep miuxing on low flame and combine well till it comes together(2-3 minutes).Switch off flame. Apply a little ghee on palm and using both hands,bring the mixture together and make cylindrical shapes.Make 4-5 cylindrical shapes. Wrap in cling wrap or aluminium foil and refrigerate for one hour.After one hour,cut in slices and serve it. Refrigerate left overs and store in air tight containers. 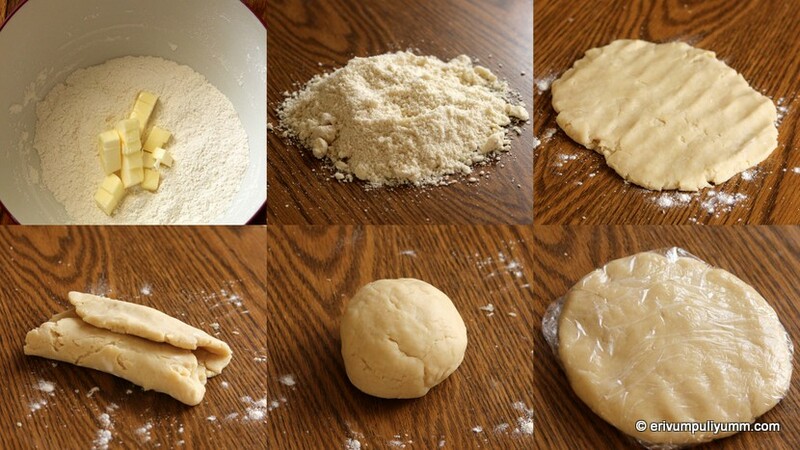 *The recipe is adapted from here. * Use the soft dates to make this recipe as with the hard ones its difficult to hold together and breaks in pieces once sliced. * You can finally roll these cylindrical shaped rolls in pistachio powder or coconut to add a coating which I omitted. * If you are using freshly grated coconut,then roast the coconut separately so that the moisture is dried out and then add to the dates nuts mixture.But make sure the coconut is not very much browned. Jam making really requires good efforts but the results are worth doing.The sealed packs from stores is easy to buy and may be much cost effective too but that hardly has any real fruit flavors and tastes.All are loaded up with sugar,artificial colors and preservatives.My mom always made sure to prepare all kinds of seasonal fruit jams when the fruit rates go low and she used to preserve the jams for over six months by bottling them in separate smaller bottles.That bug of jam making has bitten me too and I also have given up the store brought jams.Kids love jams with almost everything; infact their love goes even with idlis or dosas rolled up for an evening snack.Last month,blueberries were on sale and I got few packets of these.Finally ended up making this jam,this was super easy and delicious to make,all it needs is a little extra time to stir.I have used frozen strawberries that I picked up sometime back when on sale and freezed it.Both together made a lip smacking combo.I haven't added any preservatives other than lemon juice,it stayed good for a month without refrigeration.Try this and kids would love it!! -Wash,hull the strawberries and chop them in chunks.Wash the blueberries and add to a pan with strawberries.Add in sugar and heat the pan.The berries ooze out water and sugar gets dissolved. -Place a plate in the freezer to check the consistency of the jam till you use. -Keep stirring in between and the berries gets cooked(it may take 45-55 minutes).Using the wooden spatula or potato masher,keep mashing the cooked berries to integrate in the liquid.The pectin in the fruit thickens up the jam and at one point,you can see the base of the pan when stirring.Add in the lemon juice and mix well. (To check the consistency of jam-Drop a little on the plate placed in the freezer.Wait for 45 secs and then tilt the plate to check if the jam is flowing down.If it stays in place then,the jam is ready.Switch off flame,move the pan away from residual heat and leave to cool). -After cooling,the jam thickens and can be stored in air tight sterile bottles(I prefer storing a small amount in a bottle outside at room temperature and refrigerating the rest). -Spread on your whole wheat bread or any other kids snack/bread and enjoy !! * You can use a combo of any other berries like raspberry,blackberries to make this jam. * I have used frozen strawberries to make this jam,so it was in a way easier to mash well.But you can use fresh strawberries too. *There are few chunks still present in the jam which adds a taste. Mexican dishes are loved by my family and this mexican rice is one of my kids favorite too.We first had this rice at a mexican restaurant(after reaching US) and we really liked the flavors.The rice tastes similar to tomato rice flavored with chicken broth.But recreating it at home was a big question to get the perfect restaurant style.I tried a few recipes wherein they used diced tomatoes but that didn't give a perfect texture of the restaurant one.Frying the rice in oil like we do for biriyani is an important step to get a non sticky rice.Finally,I ended up getting in these final measurements that worked just fine for me.However,restaurants use tomato paste and canned tomatoes that have a darker color and gives a nice color to the rice when cooked.Fresh tomatoes don't yield that bright color when cooked but flavor wise tastes great.This is a simple quick fix rice that we don't need any sides and love it just like that !! Wash and cut the tomatoes,add to a blender.Add the chopped onions and blend together to a smooth paste.The puree shouldn't be less than 2 cups. Wash the rice under running water a few times to remove excess starch.Drain water and leave aside. Heat oil in a thick bottomed pan and add the rice.Saute the rice until nicely browned on low flame(takes about 6-7 minutes). 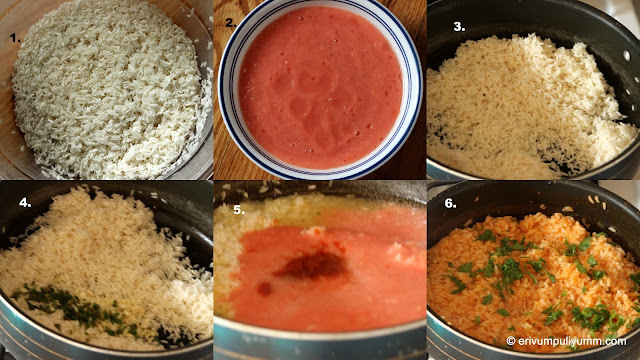 Add in the minced garlic and jalapenos(green chillies).Saute again for 2 minutes.Now add in the broth(chicken/vegetable) and add the pureed tomato mixture(2 cups),water(1.5 cups),salt and tomato paste(if using).Mix well and bring to a boil. Lower the flame and cook covered for 20-25 minutes(stir in between once or twice to check the water content and to prevent the rice from sticking to the bottom of the pan). Check the rice if done and switch off flame.Add in chopped cilantro to garnish. * Traditionally they use white rice and so used that instead of basmati rice but you can always use brown rice or basmati rice as per tastes.But remember to alter the amount of water as per your rice. * I personally don't like tomato paste and so don't buy.I used pizza sauce instead which works fine and has oregano in it. * You can add cumin or oregano too to suit your taste buds. 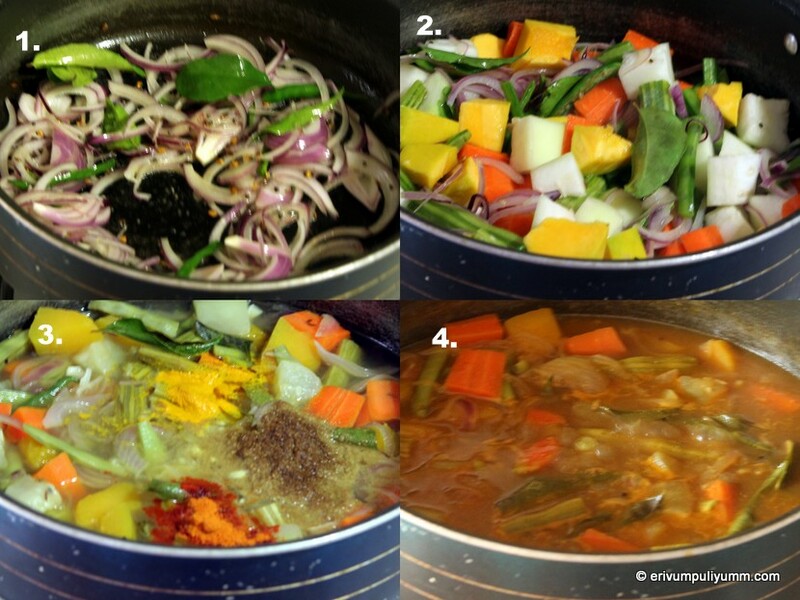 * You can even add corn,peas or diced carrots to make it taste like a pilaf(pulao) style. * I used chicken broth but you can always use vegetable broth if you are a vegetarian. * I have used 1.5 cups of water as my family loves the rice well cooked.But you can always add 1 cup water and check in between for the cooking.This may also vary with the type of brand and variety. * I used regular Indian green chillies and so used 4 chillies.But if using jalapenos,then modify as per tolerance. * You can sautee the onions along with garlic and leave it just like that,tastes good too.But here when we had in restaurants,they had no visible veggies in it and so I pureed them to recreate the original flavors. Last month and this month till yesterday was very busy with a couple of birthdays lined up,our anniversary,school re opening and so on.Yesterday was my younger son's birthday that marks the finish line for birthdays this year in the family too.This month's baking partners challenge was these galettes suggested by Suja @Kitchen Corner-Try it and Swathi @ Zesty South Indian Kitchen.The recipe is adapted from here.I tried both savory and sweet version as I knew kids would nod 'yes' to the sweet version and savory was liked by us.Both fillings were tasty,flaky and delicious. 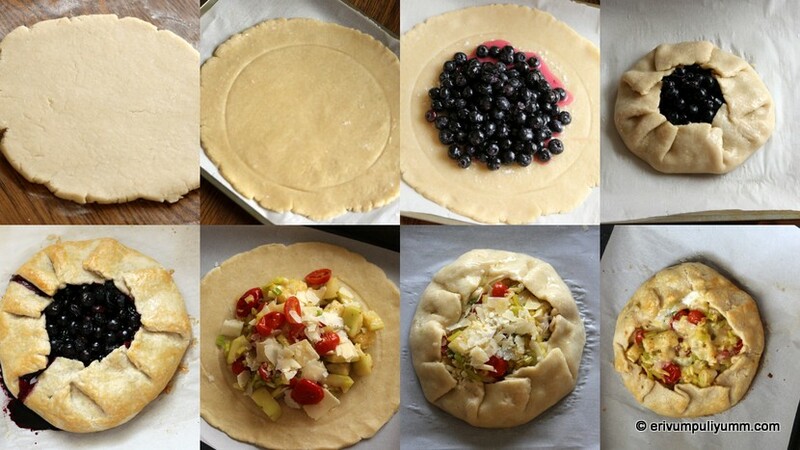 I tried the sweet version with blueberries and the savory version with bottle gourd,cherry tomatoes and green onions.The savory filling in the original recipe was zucchini but I tweaked in bottle gourd which worked fine too.The outer covering is flaky like puff pastry or pie crust.Both the filling and pastries were delicious.Try and enjoy !! 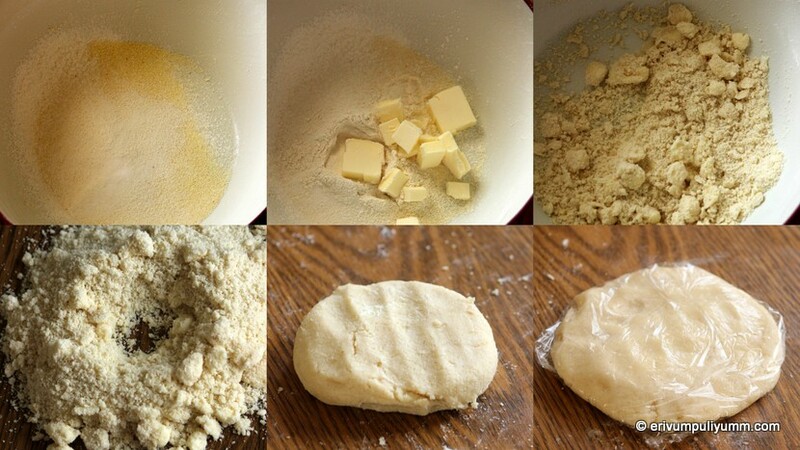 FOR MAKING DOUGH(SWEET/SAVORY)- In a large bowl,mix the flours,sugar and salt(sweet version).If you are making savory version then all purpose flour,semolina,salt in a bowl.The remaining steps remain the same for both versions.Cut butter in small cubes and add to the flour.Using a pastry cutter,cut in through the flour rapidly till the mixture looks coarse.The butter may look pea sized of if you are using food processor,then pulse it several times till it attains the texture.Add in the ice cold water 1tbsp each at a time.Mix together to bring together and the butter remains small size.Transfer in a lightly floured surface and flatten rapidly pushing the dough with the heel of your hand.Rapidly pat and smooth the top.Lift the dough off the work surface using a pastry sheet.Flip the bottom of the rectangle to the bottom and the top down to cover like an envelope.Tuck the two sides toward the bottom.Cover in plastic wrap and refrigerate for half an hour to relax the gluten. 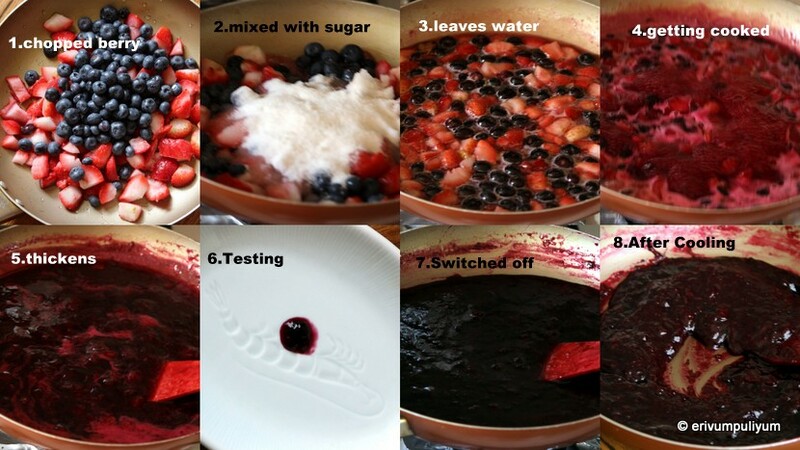 MAKING SWEET FILLING-Wash,pat dry the blueberries.Add sugar,corn starch and lemon juice,mix well and keep aside for 15-20 mins. MAKING SAVORY FILLING-Heat a pan and add olive oil.Place the tomatoes salt and red pepper flakes.Cover and heat over high heat.Roll back the tomatoes frequently so that the tomatoes are evenly cooked.Turn the heat to medium and add the lauki/bottle guard cubes.Saute for 3-4 mins until it softens.Add chopped scallions and stir fry quickly.Switch off flame and cool the filling before adding. MAKING THE COVER- Pre heat oven to 350 degrees F and line a tray with parchment paper.Remove dough from refrigerator and place on a lightly floured surface.Roll in a circle of 1/8 " thick circles.You can use a plate and cut in desired shape(I skipped doing the shape cutting as I had both dough separately and didn't wish to leave out cut out crumbs). Flip on to the prepared tray and place the prepared disc.Unfold it and sprinkle a mixture of flour and sugar(already mixed in ingredient list above).Place the filling(sweet blueberry version or the savory bottle gourd version) in the middle leaving 3" border.Fold the edge up over the filling forming loose pleats.Gently press the pleats to stick together.Sprinkle coarse sugar(for sweet version) and if using egg wash(optional),then brush and then add sugar.For savory version,sprinkle parmesan cheese on top and in between.Bake in oven until the sides are brown and the filling is bubbling.Remove from oven and cool down a bit in the pan,transfer to wire rack. 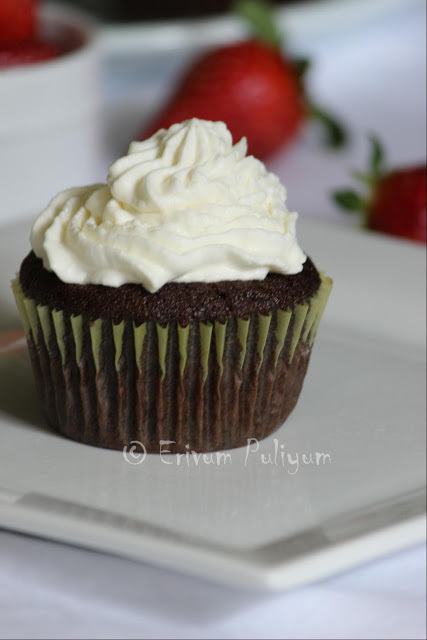 * If you don't have cake flour substitute making cake flour by adding 2tbsp of corn flour in a cup and filling the rest of the cup with all purpose flour(maida). * I have adapted the savory filling from here but tweaked to our tastes.The original recipe uses zucchini but I used zucchini. Enjoy making it at home !! Quinoa flour finally was incorporated in this batter and made pancakes out of it.They tasted delicious without any over powering nutty flavors.They were very light,soft and adding blueberries made them perfect to be served without any accompaniment.The cinnamon in the pancakes reduces the nutty flavor to a large extent.However,I served these with vanilla yogurt for kids and they totally enjoyed.I have made these a couple of times and is a fool proof one.The recipe was bookmarked from the book,'500 Quinoa Recipes' and the original recipe doesn't ask for blueberries and the original recipe had one egg which I replaced with only egg white.I incorporated these cutees in the batter and kids loved it.You can make these pancakes without blueberries too,tastes delish.Though the pancakes were very tempting but my pics haven't proved it well though.I waited for clicking a better pic next time,but each time this is a breakfast menu or a weekend breakfast menu which makes it hard to click pics patiently.Anyways,my H is become a big fan of this pancakes which otherwise doesn't happen with pancakes.So,do try and enjoy !! Combine the quick oats and half of the butter milk,let it stand for 10 minutes. 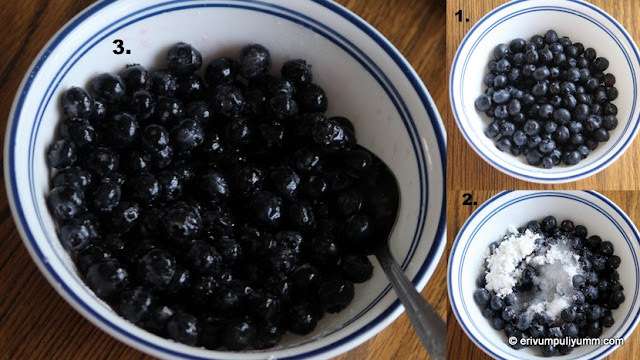 Wash the blueberries,pat dry.Remove any stalks and keep aside. 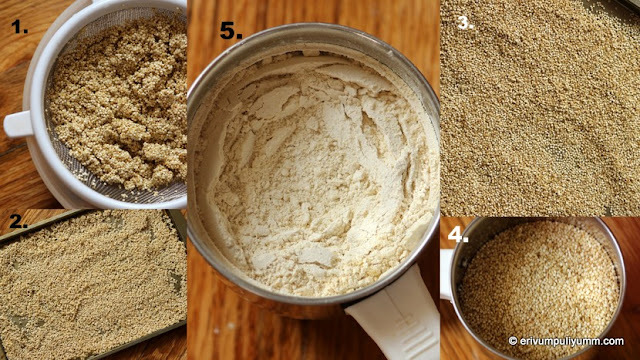 In another bowl,whisk the quinoa flour,baking powder,baking soda,cinnamon and salt. Add remaining buttermilk,the oat mixture,oil,honey,egg whites.Stir until well blended. Finally add in the blueberries,give a quick toss. Heat a griddle or skillet or non stick pan on medium heat.Spray cooking oil or add butter.Pour about 1/4 cup of batter on the pan.Spread gently to shape them in roundels.Cook until bubbles appear on top on low flame(as the bottom tends to get browner faster on medium flame).Turn pancake and cook for another minute.Remove on plate and repeat the same with remaining batter until it gets over. Serve warm with flavored yogurt,whipped cream or honey or maple syrup or just like that(we had with vanilla greek yogurt). 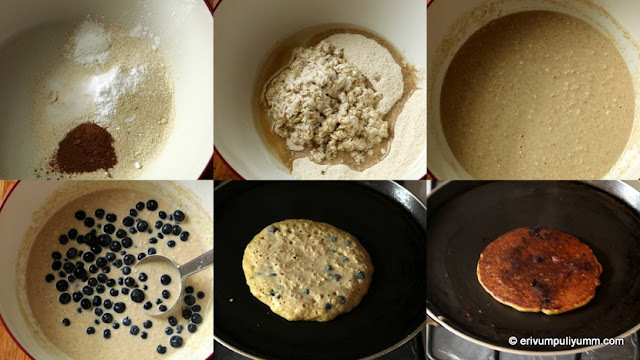 * You can try these pancakes without blueberries too or can be replaced with any other fruits that goes well with pancakes. * I have used homemade quinoa flour but you can use store brought flour too. * You can use just yogurt(3/4 cup) mixed with water(1/4 cup) instead of buttermilk OR substitute 3/4 cup yogurt with 1/4 cup milk for making 1 cup buttermilk. * You can add one egg too if you wish to try that way as in original recipe but I tried adding only egg white and it was just soft and binded well.I even tried making without egg which works fine too but they tend to break easily unlike the one with egg white.The egg white binds the pancake and prevents from breaking. 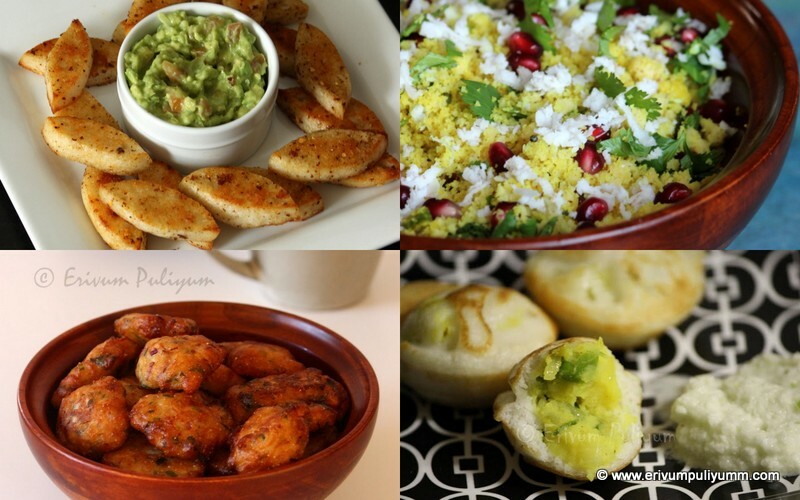 For more quinoa recipes,check this link. Quinoa is a protein packed healthy seed that can be added or replaced to any other flours with a few twists and tweaks.Though I had been using this seed for quite sometime now,but hadn't given this flour a try.Making it from scratch is very simple and can be made quickly unlike many other flours.Use a coffee grinder or an indain type heavy duty mixer to grind the seeds very fine.I have a few recipes in line that I tried with quinoa flour and had been a hit at home.The upcoming post is one similar one too.Quinoa has a natural bitter coating of saponin which dissolves when quinoa is rinsed.Quinoa flour can be easily added to many recipes like muffins,cakes,pancakes,crepes and much more.If you love this post,do try and make your own batch !! Wash and rinse the quinoa by placing it in a fine mesh(so that the seeds don't flow out) to remove the saponin if any left out. Shake of any excess water from the seeds or spread on layers of paper towel to absorb water from the rinsed seeds. Pre heat oven to 350 degrees F and spread the rinsed quinoa on a rimmed baking sheet.Place in oven and toast for 12-15 mins and mixing,re spreading half way so that its toasted evenly.The seeds may turn slightly golden and fragrant. Store in air tight containers until use upto 6 months or freeze for a year. 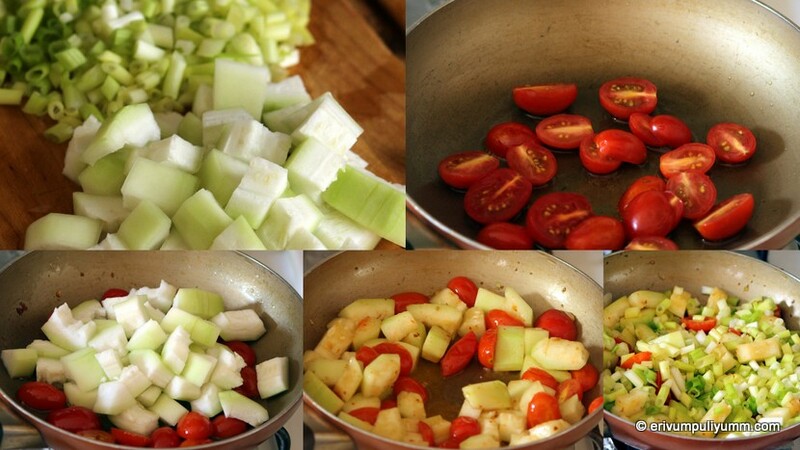 * You can toast the seeds in a skillet too instead of oven by frequently stirring until the seeds starts to pop.